Whale entanglement. Photo courtesy: Hawaiian Islands Humpback Whale National Marine Sanctuary. Marine mammal response manager, Ed Lyman, will be the featured speaker at a lecture tonight hosted by the Hawaiian Islands Humpback Whale National Marine Sanctuary. 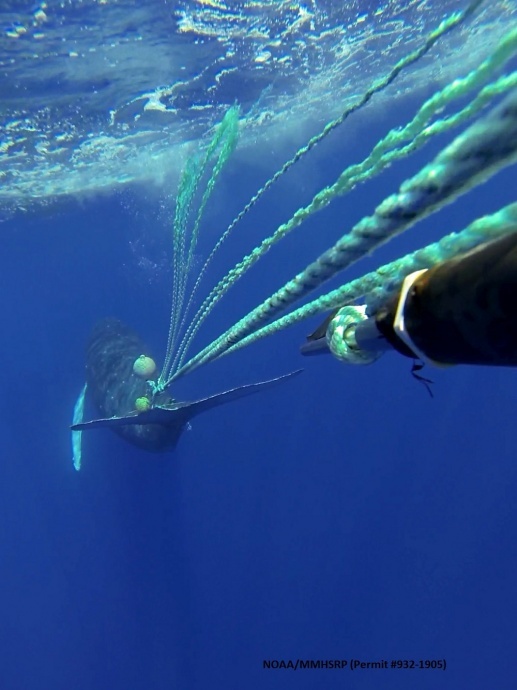 The talk, entitled, “A Cut Above: Confessions of a Whale Disentangler,” will explore past adventures and provide an update of the most recent endeavors of the Hawaiian Islands Entanglement Response Network. The multi-agency response team, led by Lyman, has mounted nearly 130 responses in Hawaiʻi, and freed 17 whales to date. In March, the team successfully disentangled a humpback whale  stuck in fishing gear and line in waters off of Maui. Tonight’s lecture runs from 6 to 8 p.m. at the Sanctuary Conference Room on South Kīhei Road.